The holy land of Punyanagari got holier when the lotus feet of Amma first kissed its soil way back in 1989. Since then, Amma has been coming regularly to meet her Pune children. The Ashram land in Nigdi was bought in 1991 and Amma consecrated the Brahmasthanam in the year 1992. This was the fourth Bramhasthanam to be consecrated by Amma. The Ashram is situated in an area of 2.5 acres in Yamuna Nagar, Nigdi, around 20 kms from Pune railway station and around 23 kms from the Pune Airport. The greenery, serenity and tranquility in the Ashram, besides the spiritual vibrations, have made it a place worth visiting for the residents and devotees around Pune. When the Ashram brought this piece of land in 1991, it was considered to be very remote from the City. When one of Amma’s devotees mentioned this point to her, She mentioned about the sanctity of the place and said that this was a place where many people had performed Tapas. With that the multiplying effect of the consecration of the Brahmasthanam has made this a sought after place for people from all walks of life who are seeking spiritual solace. 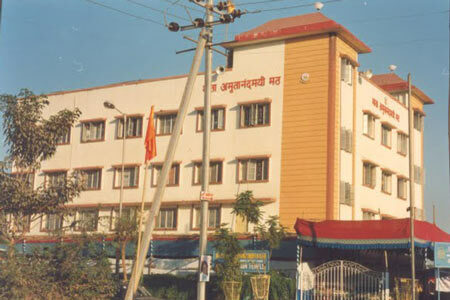 The Pune Ashram comprises of the Bramhasthanam, Ashram Hall, a Religious Library and Amrita Vidyalayam School and Junior college.